Systemic deficiencies of qi and blood affecting the heart or shen, cold hands and feet, fatigue, concentration, memory, insomnia, palpitations, restlessness, spontaneous sweating, gastrointestinal function, digestion, appetite, hypothyroid, slow healing wounds, general tonic and recovery from prolonged illness are some of the imbalances satisfied clients have used this product for. Yang Ying Wan is popular in China as a general tonic for older people. Schizandra (Wu Wei Zi) and Polygala (Yuan Zhi) direct this formula to the heart tonifying heart and blood qi. Nourish the Ying is the English translation for this formula and it means to nourish the internal organs. The original formula used Ren Shen for which Dang Shen has been substituted. Tonifies spleen and heart qi, tonifies the blood, warms the yang, calms the Spirit. Codonopsis pilosula root, Atractylodes macrocephala rhizome, Astragalus membranaceus root, Glycyrrhiza uralensis root, Cinnamomum cassia bark, Citrus reticulata peel, Angelica sinensis root, Zizyphus jujuba fruit, Paeonia lactiflora root, Rehmannia glutinosa root-prep, Schizandra chinensis fruit, Poria cocos fungus, Polygala tenuifolia root, Zingiber officinale rhizome-fresh, Botanical wax, Talcum. - Dang shen, Bai zhu, Huang qi, Gan cao, Rou gui, Chen pi, Dang gui, Da zao, Bai shao, Shu di huang, Wu wei zi, Fu ling, Yuan zhi, Sheng jiang. 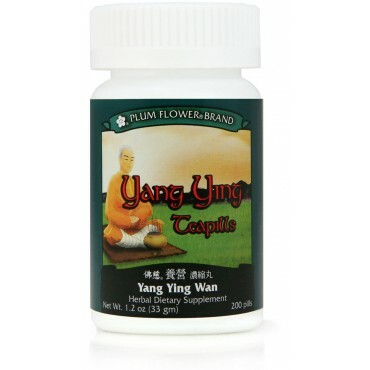 Discontinue Yang Ying Wan during colds or flu since tonics tend to drive pathogens into the interior of the body.